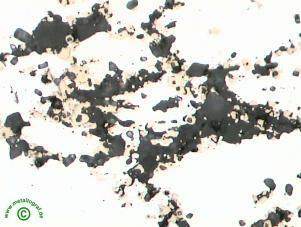 Non metallic inclusions (slags), branch-on through the casting process, can occur in the steel. If slag is washed into the steel by an irregularity during the cast, these non metallic inclusions can come to the surface proximity of the ingot or strand. After rolling the pre-material these inclusions can lead under unfavorable conditions to damages. Such defects are provable in the transverse microsection. In this case titanium carbides and oxides are also available besides the oxide slags.